Recently I spent a few hours with Cameron McNeish making some videos. Cameron has just posted one of these on his website. It's about the gear I'll be taking on the Pacific Northwest Trail this summer and you can see it here. What the video doesn't show is the increasing number of midges. My first bites of the season! 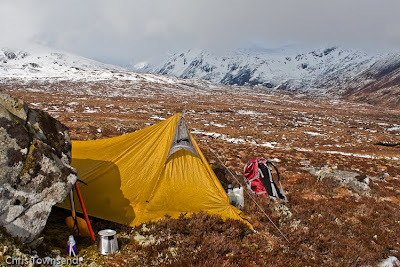 The photo shows the shelter I'll be using - the GoLite Shangri-La 1 - in use in the Glen Affric hills along with the Caldera Cone, a version of which - the Ti-Tri Inferno - I'll be taking with me. There'll be a piece on the gear in the next issue of TGO too. Interesting video Chris and the trip sounds terrific. I've never walked in the USA but maybe one day! Will we be able to follow your progress on your site? There should be reports on my site and on the TGO site and in the magazine - as long as I can sort out the technical side. I'll be taking a smartphone - not sure which one yet - and will use that for posts when I can get a signal. A nice chat about gear. I'm of the opinion that you've made some fine choices for the PNT. Why the new sleeping mat and not a NeoAir? The Pinnacle is just superb and the new one is proven durable as the old version was with Skurka using it in Alaska. I like the the idea of the quilt and the thinking behind it. What is the down to total weight ratio of the quilt? Martin, I like the insulation in the POE mat. I think this makes it a bit warmer than the NeoAir. The quilt has 335 grams of down and weighs 718 grams. I've had each version of the Pinnacle and the Gust before that and liked them all. Dyneema is a very tough fabric - it's stood up to much Scottish rock so should handle anything. Thanks Chris. I was interested as I remember you liked the NeoAir on another video. I had a Exped air mat and it was so comfy. The NeoAir is good but I don't find it as comfortable as the old Exped pad. That Pad you are taking looks good. Light, warm and comfy. I might get one and look at the latest Pinnacle as I like the new design of the back pocket. I really rate that rucksack. Some say it is too big for a TGO Challenge. I don't agree as it can be compressed and gives room for several days food. Interesting kit selection you have made and good luck for the walk. I find the NeoAir quite comfortable as long as it isn't inflated too much. The most comfortable mats I've used are the Exped down ones but I don't want to carry the weight of those and the warmth is unnecessary in summer. I guess if you're restocking every day or two and have low bulk gear the Pinnacle might be too big for the Challenge. However I often carry 5-6 days food. Plus there's my camera gear too. As a beginning backpacker age 66 I have followed your advice closely through your books and now these wonderful videos. I am embarking on a 10 day trek in the Sierras in two weeks and am trying to reduce my weight down from 26k. I would love not having to carry the bear vault. What is your bear plan for the PNT adventure? Are you caching food along the way? Hi Walt, glad to hear you like my books and videos. On the PNT I am going to hang my food in some areas, sleep with it in others and probably use a bear canister in the Olympic National Park, where it's mandatory in some areas. I'm not caching food along the way - I'll be sending supply parcels and buying it in stores along the way. Good luck with your Sierra trip. It's a magnificent area. I've hiked there several times. Looks like a great kit for the trip, Chris. 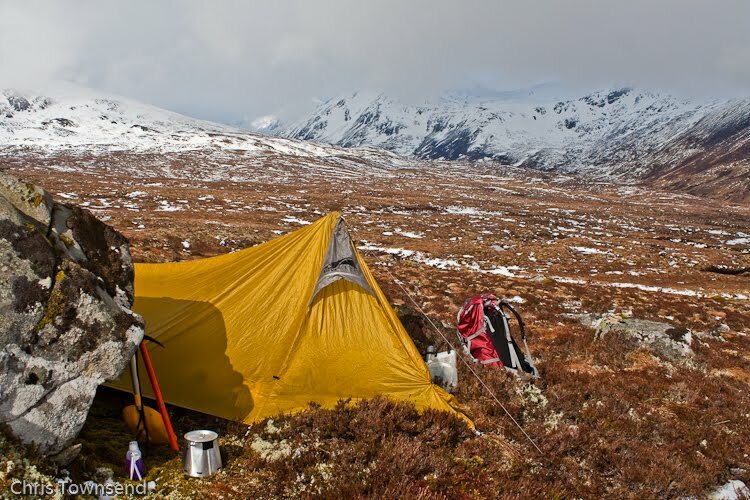 Seems like we have some of the same tastes in gear--Caldera cone, Shangri-La shelter, inflatable POE pad, Pacerpoles. Knowing that you're a serious photographer, I'm especially curious about your camera gear for the trip. Thanks Dondo. I'll almost certainly be taking the cameras I've been using for the last few years - the Canon 450D DSLR and Sigma DP1 compact. I'll definitely take the 18-55 zoom with the 450D. I'm not sure about other lenses - I'd like them but I don't want the weight! I'll also have a tripod - probably my ancient Cullman, held together with duct tape, as I haven't found anything as good at the same weight. How about a Gitzo Carbon fibre tripod? They do light weight small ones. Not used so can't comment. But the legs are good on them, quick and easy to use. Enjoyed the video, sounds a fantastic adventure. Hope you'll be updating your blog as you go. Best of luck with adventure.